On the distant planet Eternia, the Masters of the Universe battle the forces of Skeletor as he finally conquers Greyskull. Now on the run He-Man and the Masters travel through the Keymaster's key to time and space to the planet Earth. But Skeletor and his minions are not far behind them. Okay, what's wrong with Masters Of the Universe, let's start with the title. MASTERS OF THE UNIVERSE when it's HE-MAN AND THE MASTERS OF THE UNIVERSE. That's one, two He-Man and Skeletor's outfit are all wrong. He-Man wasn't born He-Man, it's a super hero name, his parents didn't look at him and said, "Let's call him He-Man." No, that didn't happened. He-Man's secret identity is Prince Adam of the city Etnernia. Secondly, Skeletor has no lips, they could have passed on the star power considering you have no idea who it is behind the make-up. Next, this was based on a cartoon and it's way too violent for He-Man, he doesn't go around killing people. The two things they got right, Man-At-Arms was pretty good and so was Evil-Lyn. The next thing they did wrong is were is Battle Cat, they could have made it a puppet. But no, they didn't have the nerve to dye a tiger. With the right company of dye wouldn't hurt the tiger. The sorceress transforms into Zoar the Falcon, no crystals. What happens when you base something on another popular media and take "liberties", you get a huge steaming pile of crap that isn't fit to watch. 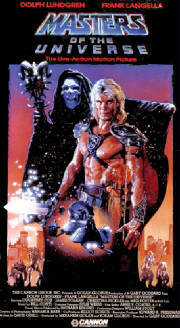 If you grew up with Masters of the Universe, avoid this movie. THE RASBERRY. I couldn't agree more, I've been a fan of the cartoon since it came out so many decades ago. Filmation did a great job. This movie however takes a great show and turns into a steaming pile of pure s***. I can't even be nice of how they destroyed the Masters Of the Universe. Daulph talks through his nose and even though he looks right for the part, he wasn't. 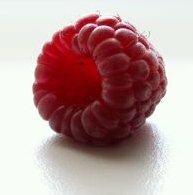 THE RASBERRY.